WASHINGTON – Virginia Gov. Tim Kaine has hitched his wagon to Barack Obama’s star, and if Obama pulls out a win today in the Virginia primary it could pay dividends for Kaine’s political future. Kaine was one of the first politicians outside of Illinois to endorse Obama last year and his name has been floated repeatedly as a potential running mate for Obama were he to win the Democratic nomination. On Monday, Obama was asked by a Virginia radio host if Kaine would be on his “short list” (he didn’t say for what). “He will certainly be somebody who is on my short list to have a role in my administration,” Obama said. Kaine, elected governor in 2005, is considered an up-and-comer by some national Democrats because of his success in the traditionally red state and his willingness to speak openly about his faith (he is a Catholic). After his election, Kaine was invited by the national party to give the Democratic rebuttal to President Bush‘s State of the Union address in 2006. The 50-year old governor gave Obama a rousing introduction at last weekend’s Jefferson-Jackson dinner in Richmond, an annual fundraiser for Virginia Democrats where the Illinois senator was warmly received. Kaine was asked several times by reporters on Saturday about being on the ticket with Obama, and he seemed to welcome the attention. 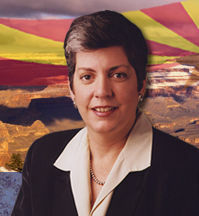 Earlier, the names of lady governors like Janet Napolitano of Arizona or Kathleen Sebelius of Kansas have been mentioned as possible pro-Obama vice-presidential contenders.